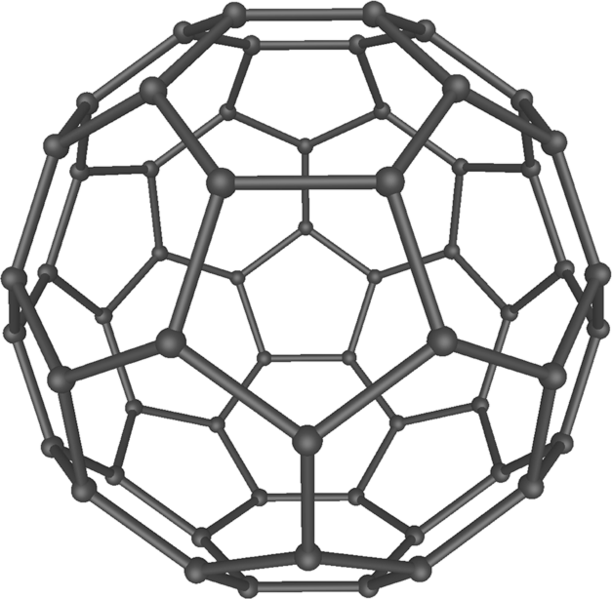 A 3D model of a C60 molecule, also called a “Buckyball”. Created by Michael Ströck (mstroeck) on February 6, 2006 from Wikipedia. When I first read this I thought it was a hoax. It might still be a hoax but I haven’t seen any indication that it is in my research. It might also be a mistake or misinterpretation of data but only time will tell about that. Scientists were investigating the toxicity of a carbon molecule consisting of sixty carbon atoms called a fullerene (chemical formula C60). Fullerenes are carbon molecules arranged in a spherical shape somewhat in the manner of a geodesic dome, hence the name “fullerene” from Buckminster Fuller, the creator of the geodesic dome. They dissolved the molecules in olive oil and administered it to rats. A control group of rats just got olive oil. Not only was the olive oil with fullerenes not toxic but it almost doubled their lifespan of the test rats. All of the test rats with the fullerene treatment were still alive when the last control rat had died. I have predicted in the next hundred years we would likely extend human lifespan significantly. This may be the beginning of that happening. Fullerenes are found in outer space and may have had a role to play in the origin of life. An article argues the fullerene surfaces may have provided a surface for the development of early life. “Conceived here is an evolutionary process in the archaic past that progressed far beyond the formation of nucleobases on fullerene surfaces. A universal origin of life from dying stars, rapid because it is expressed in parallel rather than sequential lines of development, extends evolution to well before the circa 4.5 billion years available on Earth and invites research with promise for the future”. This entry was posted in Origin of Life, Transhumanism. Bookmark the permalink. Very interesting article. I have been showing youtube videos to the recovery group that comes to Harmony and we have been watching some stuff on the Solfeggio Frequencies. That design reminds me of the visuals from water and sand that come from certain harmonies. There is so much we don’t know and so much misinformation we are living as reality it is hard sometimes to know what to believe. If an idea is mysterious and unbelievable, it probably has some truth to it. I hope your weekend at the workshop was good. I decided not to do it. I am very happy with the tank, that is my source for now.